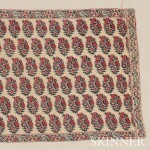 Skinner’s sold about 25 shawl items from their Boston auction room. It was primarily a rug sale but since Lawrence Kearney, expert in charge, has a connection with an obviously motivated client with a large collection of shawls it was decided to test the market waters. Overall there was nothing of high historical interest or irresistible novelty. 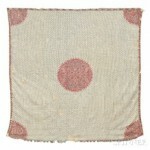 From the first group of shawls, a Sikh period moon shawl (lot 26) with a white ground, estimated $2000-$25000 went for just about the higher estimate (w/o) commission. Four went unsold. 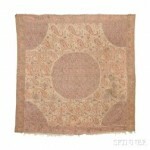 Among the second group, a late 18th c. white ground moon shawl, lot 78, est. $4000-$5000, didn’t even reach the lower estimate but sold anyway for $4305 (inclu. comm.). Whoever bought it got the best deal. While it’s botanical details left a lot to be desired, its early age was apparent by the diminutive size of the central medallion and narrow hashias (borders). Probably what kept the price low was the poor condition of the borders. As far as the rest of its condition, a catalogue photo rarely reveals the extent of damage. The third group comprised a few late 19th c pieces of lackluster interest. 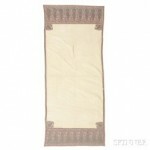 The long white shawl (dochalla), lot 133, est. $3-4000 went for $3075 (incl. comm.) which means it never reach its lower estimate. (Above photo). These are what I called the Moorcroft booth types from around 1823, the time when the latter sent back to England a group of shawl drawings in this same vein.